Students who sat a chemistry exam made up of questions from over five decades scored an average of just 25%. The experiment, by the Royal Society of Chemistry, showed students scored highest on the most recent questions and worst on those from the 1960s. One exceptional pupil, from Birmingham managed a score of 94% in the paper, sat by 2000 students last week. 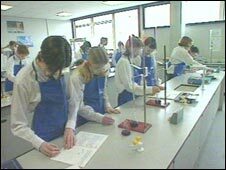 The Royal Society of Chemistry says pupils are not being encouraged to develop problem-solving skills. The paper was made up of parts of previous O-level and GCSE exam papers from the 1960s to the 2000s. Eight questions were selected from each decade, and were mixed up in the examination paper, so that students could not easily tell which decade they came from. From about 2000 entries, representing 450 schools, the average mark was 25%. The average mark for the questions from the 1960s was 15%, and for each subsequent decade, this rose steadily, reaching 36% for the 2000s, the RSC said. The organisation said that it had tried to select topics which are still being studied by GCSE chemistry students. Experts who have been looking at the results concluded that students today are required to do fewer complex calculations. "Detailed analysis of the results will be completed over the summer, and a report issued to the educational and science communities," Dr Pike said. "A preliminary finding is that pupils are unused to more complex problem-solving involving a number of steps in completing calculations, without the prompting that is prevalent in some modern examination questions." The RSC argues that universities and employers both need young people to have developed problem-solving skills. Recent papers also differed from older ones by being more topical, drawing on subjects such as nuclear power. That was a good development, the RSC argues, but there needs to be a balance between relevance and the fostering of skills needed to solve complex problems. Dr Pike added: “The feedback we have had is overwhelmingly positive, even though we know that the pupils were put under extreme time pressure and would have been unfamiliar with the content or structure of some questions. It was the novelty of the experience that excited those taking part, both teachers and pupils". The highest-scoring student, who won a £1,000 prize, was Nathan Brown of King Edward VI Camphill Boys School, Birmingham, who scored 94%. An earlier version of this article contained an exam paper in which with two of the answers had errors. This was supplied by the RSC, which has apologised for what it says was a transcription issue. What to do about 'easier' exams?